Store brands: Threat or opportunity? 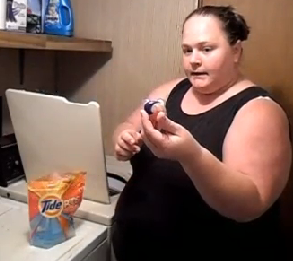 Happy consumer Antonia demos innovative, easy-to-use (and tasty-looking) Tide Pods. In January, a Wall Street Journal story, “P&G Needs to Convince Thrifty to Splurge” said that the “real challenge” for Procter & Gamble in combatting poor sales and disappointing new-product launches was to get consumers “to spend more again on the company’s premium-priced products.” But the reporter “missed the point,” Robert Hogan of Zip-Pak told attendees at the CPA 2013 Annual Meeting in late February because there’s no difference in product quality between private-labeled store brands and traditional, national brands. The real challenge, then, is coming-up with innovations that will resonate, like the next iPod… or Tide Pod, in the case of P&G. Nielsen research cited 21% dollar growth in private label from the onset of recession until 2011, while in the same period, national brands logged only 3% growth. Brand loyalty and consumer satisfaction varies across categories, and NPD Group research partly refutes Nielsen’s findings, but everyone agrees that innovation is key. Will consumers care if the R&D behind that innovation comes from a manufacturer-owned brand or is the result of a retailer who decided to partner with an enterprising contract manufacturer/packer? Today, I’m hearing that traditional co-pack growth is in the middling single-digit range at best. In contrast, Hogan presented research indicating that store brands account for 22% of all U.S. retailer goods, a number greater than 50% in the UK and Switzerland. As with other market trends, North America is likely to follow Europe’s lead. If so, traditional brands’ power may well erode in the supply chain and at the outsourcing contract negotiating table. If you believe the co-pack industry will mature and consolidate (as I do), tomorrow’s larger outsource service providers will have more leverage to invest in their own capital equipment and innovate with their own R&D efforts. This in turn could mean that traditional brands have less power to negotiate non-compete terms, and co-packers have more power to work directly for retailers. Thoughts? My inbox is open. This entry was posted in Food & CPG, How stuff's marketed, Outsourcing. Bookmark the permalink.